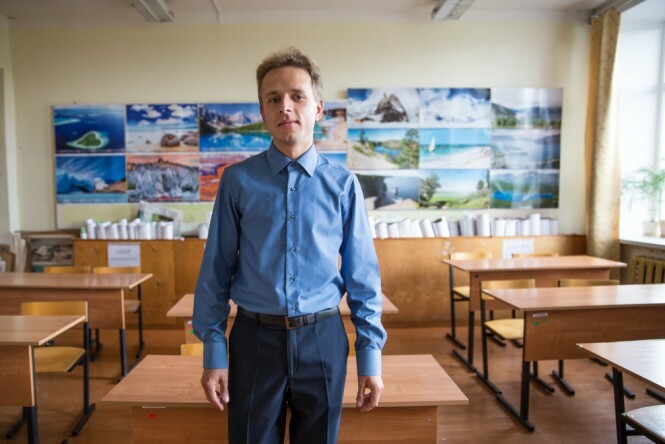 Sergey, a village school teacher. While admiring the boat-lined riverside in the historical town of Kargopol in the north of Russia one early September evening, a polite 29 year-old Russian man walked up to me and asked if I could take a picture of him and his parents. ”Sure, with pleasure” I said in Russian with my thick American accent. He quickly caught on that I was a foreigner and introduced himself in English as Sergey. He said he was an English and geography teacher in a nearby village and after talking with him for about 10 minutes, he invited me to come and visit his school. As we traveled in his parents car to the village of 300 people that lies 40 kilometers away, Sergey told me his background. He grew up in Ulyanovsk, the birthplace of Vladimir Lenin on the Volga River, received a degree in teaching from the local university and then took a job working for Coca-Cola in sales. Sergey on his way to work in a village. After leaving the American beverage company in 2014, he traveled around Latin America by himself for several months. Upon returning to Ulyanovsk in the summer, he began to look for work as a teacher. However, the salary for teachers at schools in Ulyanovsk disappointed him. He would not be able to live on his own with such a salary. So, Sergey began to look for teaching jobs in other locations. An internet search turned up a village school in Russia’s north that offered a much higher salary than Ulyanovsk, free housing and more vacation days. To attract teachers to the far-flung regions, the government gives additional benefits. The catch was that the housing was in disrepair with no running water or gas heating, much less modern amenities like a washing machine. Sergei would have to fetch water on the street and gather wood for heating. Nonetheless, the positives more than offset the lack of amenities and Sergey began teaching in the village on Sept 1, 2014. Having lived and taught more than a year in Tkhmanga village, Sergey told me some anecdotes about life and education in the village that I wanted to know more about. Sergey agreed to answer some question for this blog about what it is like for a city person to move to a distant village, what the pluses and minuses are and what changes he would make. Our Q&A is posted below. For more photos from the village of Tikhmanga, please click here. The entrance to Sergey’s school. What were your expectations of what village life would be like? How has it differed from your expectations? Well, first I’d like to say that village life is not new for me. As a child, I spent a lot of time living in the countryside with my grandmother and grandfather during the summertime. Their village was smaller than Tikhmanga, with only a few houses and no shops. When I called the school headmaster before coming, she told me what my living conditions would be like, so I had some information. I knew that there would be no water and no central heating. I did some research on the Internet before I left Ulyanovsk. I liked the photos of the village – it was rather nice and beautiful. I didn’t expect very much from village life, and thus it didn’t differ from my expectations. What is the biggest negative surprise about life in the village and what is the biggest positive surprise? Well, the biggest disappointment is the isolation. We live 120 kilometers away from the nearest railway station, but it is in the middle of nowhere. To get to the train station, we have to take two buses. The first takes you 40 km to a town and the second 80 to the train station. But the first bus goes only once a day and there are only a few buses that travel the second 80 kilometer leg. We live only 40 km away from Kargopol, the centre of the district. But to get even there is a problem. So I hitchhike more often than traveling by bus. Hitchhiking is very good here. It’s also disappointing that many trains pass Nyandoma (where the railway station is) late in the evening or at night. This is because it is situated between Moscow and Arkhangelsk. It’s very inconvenient as you have to spend a lot of time waiting for a car or bus at such hours. Another problem is that there is nothing to do here in Tikhmanga. When you have free time, there are only a few options. I like to pick mushrooms, but the forest is far away from the village and you have to walk several kilometers to get there. Besides the forest is not very good in any case as there is a lot of grass. Thus it is difficult to look for mushrooms and there are few berries. My first year was very difficult as I didn’t have a bike or skis to get to the forest easily, but now I have both. Another thing I don’t like is the narrow choice of food in the shops and high prices for everything. When you come to the shop, you don’t buy what you want but only what is available. What surprised me very much was the quality of local dairy products. They are really tasty and have no preservatives. They are 100 % organic and much better than in Ulyanovsk and Canada. They accept credit cards in the two main shops in the village, but we don’t even have an ATM. I practically don’t use cash anymore. It was a nice surprise. I am pleased that the ecological situation here is very good – there are practically no cars, no pollution, the water is excellent and the air is very fresh. I also like the “white nights” in June and the Northern Lights (Aurora Borealis) in winter, which I saw for the first time in my life. It’s really very beautiful. I like the winter here. We have a lot of snow which is very white and not dark and dirty like in a big city. I don’t like that we have lack of sunshine and a lot of gloomy days in autumn and a lot of mosquitos in summer. As someone that grew up in a city, what is the hardest thing to adjust to? Well, at first is was really difficult to live without modern conveniences, especially without running water. I didn’t even have a washing machine, so I had to wash my clothes by hand and rinse them in a cold river water. It was awful. 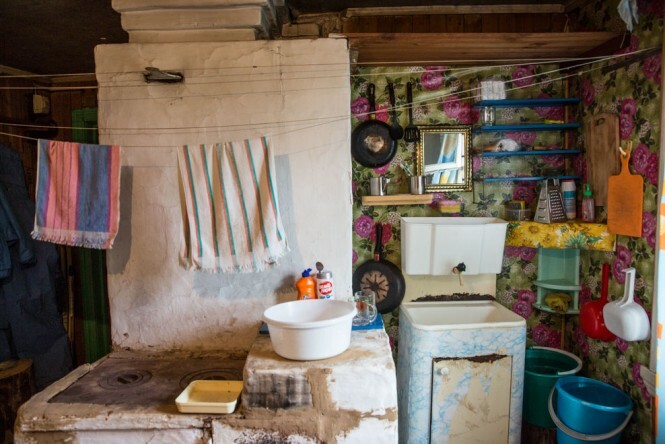 Is there a difference between people in the village and in Ulyanovsk? Yes, there is a huge difference. People in the village are kind. They will help you and won’t offend you. But most of them don’t have university education. Some of them have very weak educational backgrounds and rather narrow interests. As a result, I don’t communicate with people in the village much. There are no topics we can discuss together. Plus, I don’t drink vodka and they do. If we compare the Tikhmanga school children with my classmates in Ulyanovsk in the late 1990s, there will also be a huge difference. I was really shocked by their behavior. They don’t respect the teacher at all. They can take whatever they want from the teacher’s table. They can scream or curse at the teacher, listen to music or talk when you’re explaining the lesson. When I went to school in Ulyanovsk, we respected our teachers. We couldn’t even imagine to behave like this. Their educational level is weak, but it’s not their fault. Their parents don’t set the right example. If there is a problem with alcohol in the family, won’t it impact the children? I’ve recently heard that no one entered the University from Tihmanga’s school in the past two years. Does the quality of the school differ from that in say Ulyanovsk? Well, the quality of education in Tihmanga school is very high. All the teachers are very good. The problem is that we can’t give 100% of our knowledge because the children are not inquisitive and won’t be able to understand it. Thus, I try to explain nearly everything in a very simply way because otherwise they won’t get it. Especially during English lessons. For instance, some pupils from the 6th grade don’t know how many meters are there in one kilometer. They gave me answers like 1, 10, 100. Another example. It was for the 10th grade. I asked them to solve a problem: “Imagine that we have 100 tons of oil. If we will use 1 ton of oil per year, how many years we will be able to use the oil for?” They couldn’t answer it. So I tried to make it easier. I told them that we will use 50 tons of oil per year. They gave me a lot of incorrect answers and only later they solved it. In Ulyanovsk school we had a very high level of education and we could manage the advanced school program. Is the school equipped with the technology latest tools like computers and Internet? Do you use computers at your lessons? Yes, the school is really well equipped! We have an excellent Information technology classroom with modern computers. Also every teacher has a PC with a projector in the classroom. As for me, I use it a lot – I show photos, videos and other interesting things to make my lessons more interesting. We also have Internet (Wi-Fi) but unfortunately it is very bad. There is no connection in some classrooms and even if you are lucky to connect it will be very slow! It can’t even update my antivirus! We also use such modern technologies as an electronic diary (register) (dnevnik.ru). We don’t have a paper diary (register) where we put school marks, we use only an online version. Many schools in Russia (even in Ulyanovsk) still use 2 versions of a school register – a paper and an electronic one. If you could change something at the school, what would it be? I would change the school program. It is very rich. I had to go to school for only 10 years and today school children have to attend for 11 years. And we studied less things than school children do now. The program is rather complicated. Pupils have textbooks for every lesson, even for music, painting and physical education! We didn’t have this when I went to school. They also have a lot of lessons every day (about 6-7) and the last one ends at 3 p.m.
Plus they have to (nearly must) visit different clubs of interest, take part in different contests, school performances, etc… They have a lot of work to do! When I was a pupil, everything was easier. I would also prohibit using electronic devices during the lesson. Children are so insolent that they can use it during the whole lesson. And you can do nothing with it. If you try to grab a device, they won’t give it to you! If you could change something in the village, what would it be? Well, I would make bus connection better and the prices lower. Instead of a big bus they should buy a smaller one (to reduce the expenses) and make the service more frequent. It’s very difficult to change something because of the people’s mentality. For instance, every year we organize special events to clean our village from litter. My students and I clean a specific area. But after a short time, there is garbage again. So we have to clean it once again. I tell my students a lot about ecology but sometimes I see how they throw garbage on the ground, in the river or out of the classroom window. Alcohol is a serious problem. Many people drink a lot – sometimes I can see some of them laying on the ground. But we can do nothing with it. Sometimes my students ask me how can I travel to different faraway places of the world – like North and South America – as it is very expensive. I tell them that I don’t drink alcohol at all and I don’t smoke. So I can save money and spent them on traveling. Thank you for article, really interesting!